Companies developing genetically modified crops risk creating the biggest environmental disaster "of all time", Prince Charles has warned. GM crops were damaging Earth's soil and were an experiment "gone seriously wrong", he told the Daily Telegraph. A future reliance on corporations to mass-produce food would drive millions of farmers off their land, he said. The government said it welcomed all voices in the "important" debate over the future potential role of GM crops. However, Dr Julian Little, chairman of the Agricultural Biotechnology Council, said he was "disappointed" by the Prince's comments because "they do not seem to be based on any solid evidence". "Our experience from over 10 years of GM cultivation shows that GM technology has been found to deliver real environmental and economic benefits," he said. Mr Little added: "At a time when demand for food and fuel is rising and in the face of growing environmental challenges, we need to find ways to feed an ever-increasing global population." BBC royal correspondent Nicholas Witchell said the Prince's "robust" comments were "likely to rankle with the government", which has given the go-ahead to a number of GM crop trials in the UK since 2000. "Even for a prince who's a long-established champion of organic farming and critic of GM crops, these are comments which verge on the extreme," our correspondent said. 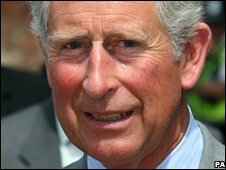 Prince Charles told the newspaper that huge multi-national corporations involved in developing GM foods were conducting a "gigantic experiment with nature and the whole of humanity which has gone seriously wrong". Relying on "gigantic corporations" for food would end in "absolute disaster", he warned. "That would be the absolute destruction of everything... and the classic way of ensuring there is no food in the future." What should be being debated was "food security not food production", he said. He said GM developers might think they would be successful by having "one form of clever genetic engineering after another", but he believed "that will be guaranteed to cause the biggest disaster environmentally of all time". Prince Charles, who has an organic farm on his Highgrove estate in Gloucestershire, said relying on big corporations for the mass production of food would not only threaten future food supplies but also force smaller producers out of business. "If they think this is the way to go, we will end up with millions of small farmers all over the world being driven off their land into unsustainable, unmanageable, degraded and dysfunctional conurbations of unmentionable awfulness," he said. The prince also told the Telegraph he hoped to see more family-run co-operative farms, with producers working with nature and not against it. The Prince's comments come at a time of rising world food prices and food shortages. The biotech industry says that GM technology can help combat world hunger and poverty by delivering higher yields from crops and also reduce the use of pesticides. In June, Environment Minister Phil Woolas said the government was ready to argue for a greater role for the technology. But green groups and aid agencies have doubts about GM technology's effectiveness in tackling world hunger and have concerns about the long-term environmental impact. Responding to the prince's comments, a spokeswoman for the Department for Environment, Food and Rural Affairs said: "Safety will always be our top priority on this issue." Anti-monarchy Campaign group Republic said: "Prince Charles is quickly making his position as heir to the throne untenable with his meddling in politics."